The IG Farbenindustrie chemical concern was the unquestioned leader among industrial firms in utilizing the labor of Auschwitz Concentration Camp prisoners. As one of the pillars of German economic self-sufficiency since before the war, IG Farbenindustrie enjoyed the full backing of the state authorities when it came to the allotment of credit, raw materials, and labor. Many such investments were inspired by the state. This is hardly surprising, since Farbenindustrie representatives occupied key positions in the state apparatus. The cartel controlled the entire production of synthetic rubber and a significant portion of the production of synthetic fuels. Since the factories that had been built before the war were unable to keep up with demand, it was decided to build two more plants, with one located in Silesia. Factors taken into account in the preliminary 1940 decision to locate the second plant at Oswiecim included the proximity to raw materials (coal, lime, mineral salts, and water) and the fact that the location was out of range of Allied bombers. The fact that the newly opened concentration camp could supply the needed supply of inexpensive labor had an influence on the final decision, taken in 1941, to build the plant. 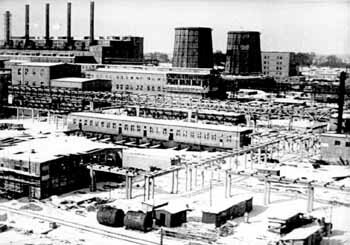 The plant was bombed several times by Allied air power in the second half of 1944. The photo below shows Buna Werke, one of the IG Farbenindustrie chemical plants set up in Oswiecim during the war. Its construction cost the lives of tens of thousands of Auschwitz concentration Camp prisoners. Source: The State Museum of Auschwitz-Birkenau. Reprinted with permission.